Eric Deaton of Strike Mor Pro Shop drilled our test equipment. For Sean and Jeff, this layout is intended to get into a quick roll and quick transition at the breakpoint. Larry’s layout will be similar but with just slightly slower transition and roll to even it out. Well, it’s gold! This is probably a motion that will be very versatile and complimentary to the solid IQ Tour Edition. 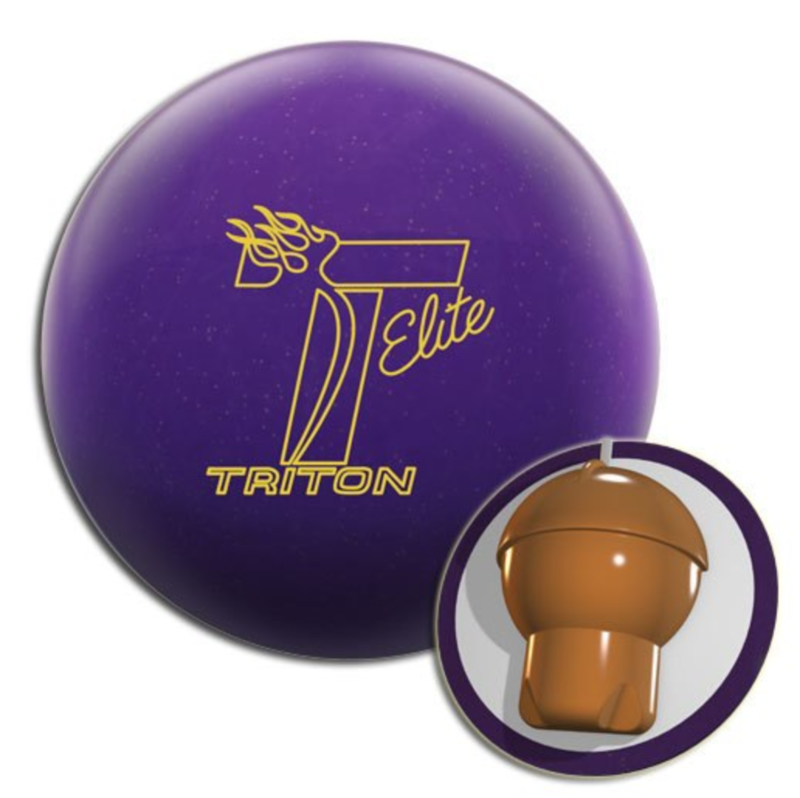 These medium-high end ball and is priced towards the higher end. However, given the potential versatility of this ball, it scores pretty well. This Storm IQ Tour Pearl uses the “newish” core called C³™ Centripetal Control Core. 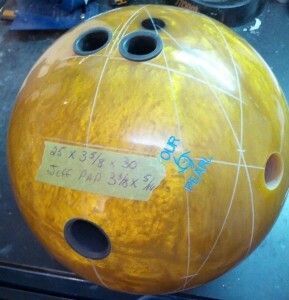 It’s a symmetrical core with an RG of 2.49 and differential of .029 for a 15 pounder. The low diff is a bit tricky, but basically the idea is to offer a control motion. This core does that and more. It is not weak by any means. In fact, you will see a lot of overall motion with this core. Another R2S pearl coverstock. Need I say more??? For those unfamiliar, this is the venerable coverstock that Storm has been using for many years now. It just plain works. It’s versatile and lasts. The Storm IQ Tour pearl seems to simply offer a good amount of length with a strong controlled midlane and backend motion. The Storm IQ Tour solid offered an excellent benchmark look. It rarely blew through the breakpoint, had a very predictable midlane read, yet was very punchy on the backends. This ball simply adds a foot or so of length, changing the shape ever so slightly. The IQ Tour Pearl will potentially be a little more usable than the IQ Tour on typical conditions for the higher rev players while the medium and lower rev players will be able to use this as a perfect stepdown to the IQ Tour solid. It will allow you to play in the same spot a little longer which is all any bowler can ask for. Oh, and it reminded us of a Rhino Pro Pearl Gold. Some found that very nostalgic. On the sport shot, the ball worked great as well. For Sean, our cranker, he had no problem getting this ball to move as usual. He was able to carry quite well. When comparing to the Lucid, the IQ Tour Pearl stored more energy and gave Sean a strong pocket shot. The Lucid burns up more energy with a more aggressive pearl coverstock combined with his high rev rate. Jeff, our tweener, found a very nice zone to play in from an inside line with a more direct trajectory how he likes to play. He also carried very well. When comparing to his Lucid, he had to be more direct with the IQ Tour. He played the same target at the arrows, but could throw the Lucid away from the pocket a bit more. The Lucid has a heavier more defined roll whereas the IQ Tour would push too long if he opened up his angles. Larry had a great look with the IQ Tour from outside. He had the same look with the solid IQ Tour, but the solid had a nice strong midlane read which gave a very consistent move to the pocket. The pearl version while playing the same line and carrying quite well does push just a little bit which makes it a perfect ball when the pattern has broken down just a little bit. Larry also compared to the Storm IQ. He had to be almost a whole arrow further inside with the IQ as it is quite strong and out to the same breakpoint. The Digitrax analysis shows varied reactions. We would normally expect the cranker to have the highest entry angle. 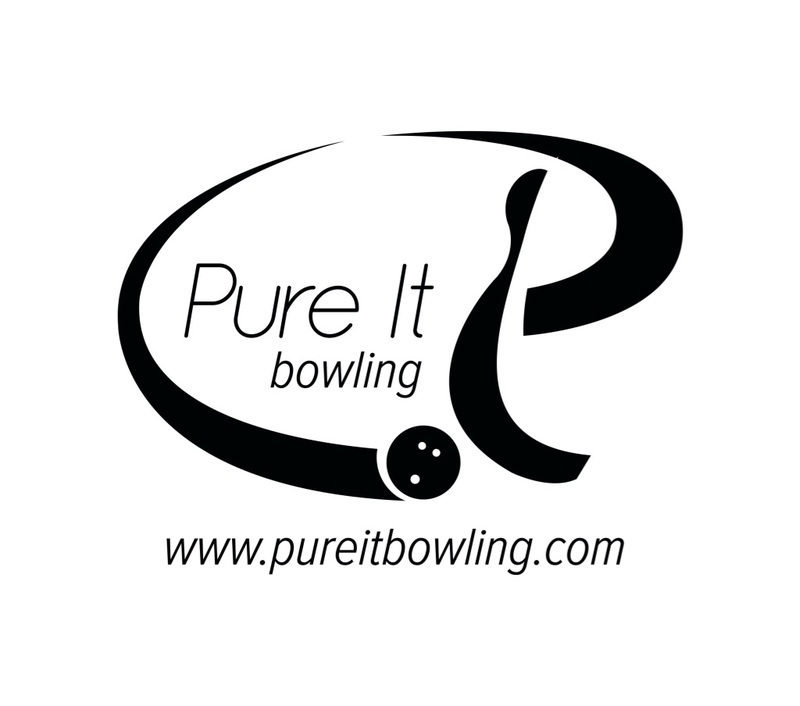 With the IQ Tour Pearl, all 3 bowlers created a fairly consistent entry angle. Overall, this ball offered a very consistent and predictable ball reaction for each bowler. There’s no surprise this is benchmark material. Above, we demonstrate some comparison tracks. 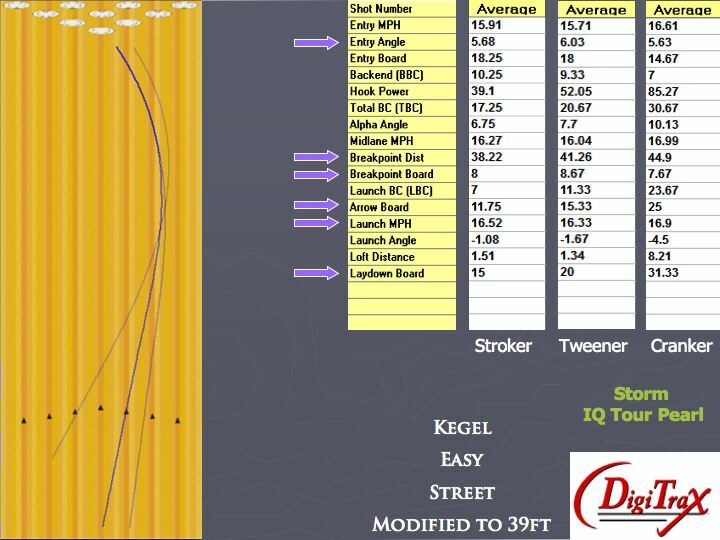 The First set of overlays are our stroker comparing his IQ Tour Pearl to the solid. You can see a small difference. Shape is identical. Basically, the solid is less sensitive to fresh conditions due to the cover while the pearl could push. 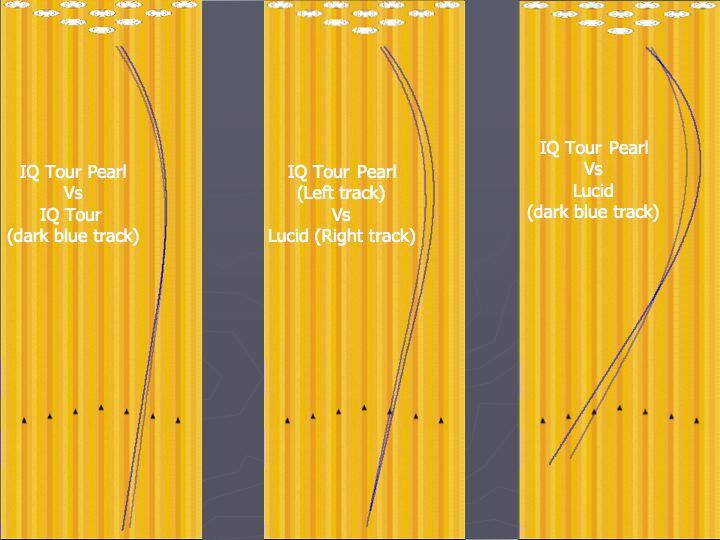 However, once the IQ Tour starts to drive high into the pocket, you can easily switch to the IQ Tour Pearl on the same line. 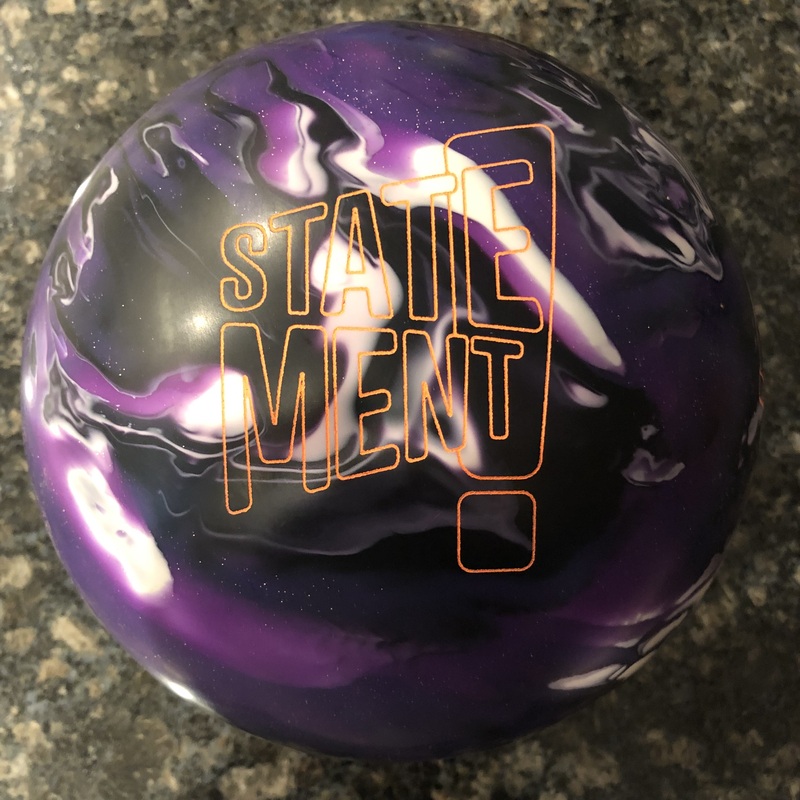 Our tweener compared the IQ Tour Pearl to the Storm Lucid which is Storm’s strongest pearl ball. The IQ Tour Pearl is smoother and less over all hook. He also saw a more aggressive move at the breakpoint and higher entry angles with the Lucid. Again, this is consistent to our expectations that the Lucid is a strong asymmetric ball while the IQ Tour Pearl is more of a benchmark-type reaction. For our cranker, he also compared the IQ Tour Pearl to the Lucid. He saw much of the same in terms of the strength of the Lucid vs the benchmark reaction of the IQ Tour Pearl. Our Stroker played Athens up 5 and saw a nice move with good entry angle to the pocket. Even the light hits carried quite well. With his IQ Tour, the same line would consistently flush the pocket. It’s just that slight difference between the solid shell on a fresh sport pattern and the pearl shell just being slightly squirrelly. It still carried the off hits. When comparing to his IQ, he had to move a good 4 boards in as it is a stronger cover with a higher differential core. For our tweener, he played further inside with a fairly direct line as you will see in the video. He got rather low entry angle, but still carried quite well. With the Lucid, he played a very similar line but was able to see just a bit stronger move through the pins. For our cranker, this was where he now saw massive entry angle. On the Sport pattern, the backends are even crisper than normal in this house so there’s good backend motion. This ball doesn’t absolutely fly off the dry like a skid/flip ball, but in Sean’s hands, it really moves. He compared to the Lucid which again gave this pronounced move off the spot. All of this is to say the IQ Tour Pearl is a versatile ball. 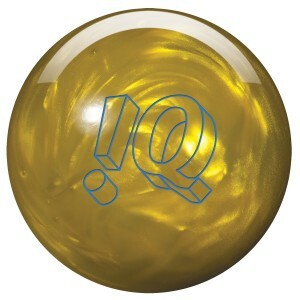 The IQ Tour Edition is a very nice, predictable, strong ball which offers good versatility for the price. If you have an IQ Tour solid, the pearl is an absolute must. There isn’t a massive difference between the two in terms of hook shape which makes them perfect compliments. For those with higher revs who may have found the IQ Tour solid too strong, the IQ Tour Pearl could just be your benchmark ball. hi coach T i have a problem of bending over when about to throw the ball. just wonder if theres anything i can do to break this problem. Hi Gene, do you have a video you can send me? How do u think the IQ tour pearl compares to the Roto Grip Critical Theory or Infinate Theory? Longer? Smoother? Would the IQ tour Pearl still work on carrydown? Hi Ron. I would say the IQ Tour Pearl would be smoother and covers less boards than the Critical Theory. The core in the Critical makes a very defined motion. Not skid flip, but you can see it transition and it rolls very heavily. The IQ Tour will have a smoother transition although it would likely be longer. The Critical is a more aggressive pearl. It’s a shame Roto has decided to discontinue it. IQ Tour would likely be a bit more like the Infinite than the Critical. Although the Infinite is a hybrid, the IQ Tour and Infinite have the same exact final factory finishing. The Infinite and IQ Tour Pearl would probably be pretty close in overall length and board coverage. 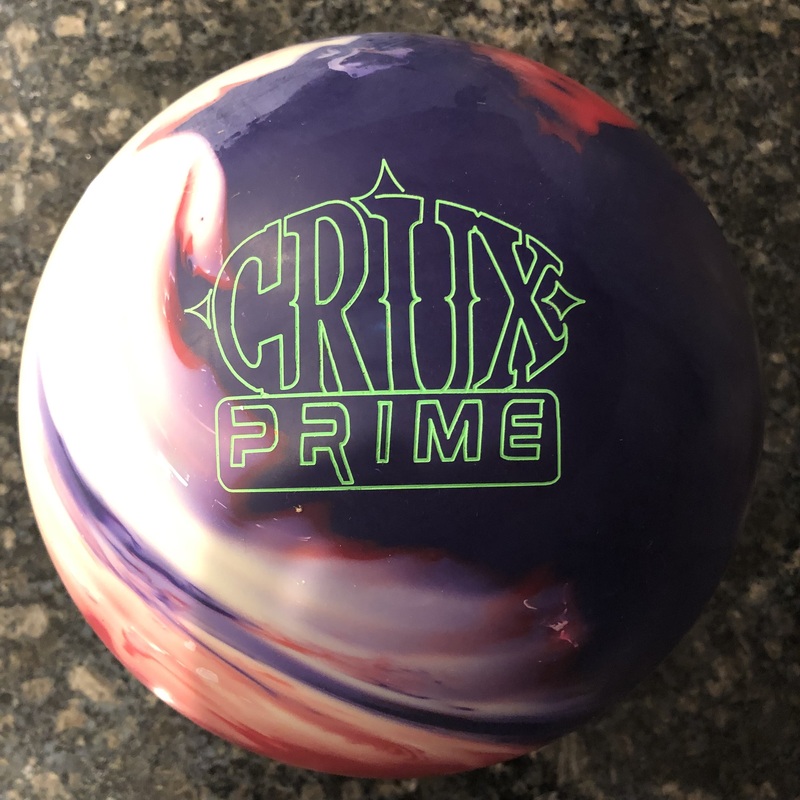 I have a Ebonite Playmaker and love it. What ball today would be similar to my Playmaker? How would the Storm IQ compare? Hi Dennis. That will be a tough one. The Playmaker uses what I consider one of the best cores of all time, the VII. Very versatile benchmark core. I think the Storm IQ Tour Pearl would be cleaner through the heads and may not give you the same exact shape. The Storm IQ Tour solid (if you polished it) might be more similar as would be the HyRoad.